As the world's greatest Catholic fraternal organization, the Knights of Columbus are called to build a community of brothers and sisters who accept and care for one another; serve as leaven of reconciliation and unity for the whole human family. We serve the poor and suffering as we express ourselves in the principles of faith, charity, unity, fraternity and patriotism. We instill a strong sense of civil responsibility concerning the growing threats to the integrity of marriage and the family as we work to build a more just society, and defend religious liberty and the free exercise of religion. Catholic men were, tragically, dying young leaving behind widows and orphans who could not support themselves. Father McGivney was convinced that there was a way to change the ending. He knew that if the Catholic men in his parish came together in mutual aid, widows and orphans could receive the support they needed. 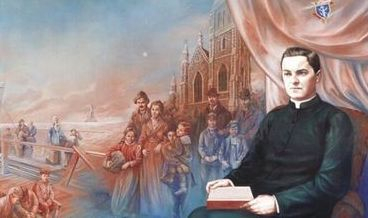 Father Michael J. McGivney founded the Knights of Columbus in 1882 at St. Mary's Church in New Haven, Connecticut. Our council was chartered September, 2007 at the request of Father Patrick Elliot, Pastor of Holy Family. The Knights of Council #14399 are involved in a wide array of activities hosting breakfast after masses once a month, bingo nights, and volunteering around the community in events such as blood drives and Coats for Kids. Council #14399 is growing, and a vital part of Holy Family Catholic Church in South Ogden. We were recognized with the Double Star Council Award for the past three years. We welcome Catholic men who are 18 or older to join us.